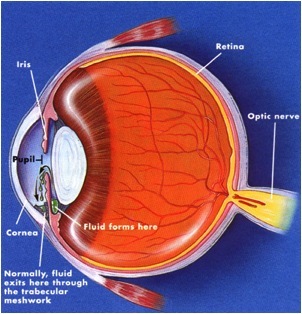 Glaucoma is the name for a group of eye conditions where the optic nerve becomes damaged and vision deteriorates. It is one of the leading causes of preventable blindness and affects around 70 million people worldwide. In England and Wales alone 500,000 people suffer from some type of glaucoma – that’s about two out of 100 people over the age of 40. The good news is that a simple eye test can detect the early signs of glaucoma and treatment can start immediately, but the tragedy is that far too many people are not getting themselves checked out until it’s too late. Some people can lose up to 40% of their vision before they are even aware there is a problem, so if you thought your vision was good just because you can still read this article, think again! The disease has no symptoms, which is why it’s known as the silent thief of sight. Pressure within the eye slowly rises, causing damage to the optic nerve and a gradual loss of peripheral vision and, if left undiagnosed, can result in blindness. Anyone can potentially develop glaucoma but there are some groups of people that are considered to be at a higher risk. The most common factors are age – over 40s are most at risk – and family history. Because glaucoma tends to be a hereditary condition, eye tests are free for anyone who has a close family member diagnosed with the condition, so that makes two good reasons for having a check up. This is the most common of the four, sometimes referred to as chronic glaucoma, and is a slow progressive condition. This is the type of glaucoma that affects at least one person in 200 over 40 years of age so regular eye check ups are essential to monitor eye health and spot the signs. This type of glaucoma should be treated immediately to relieve pressure in the eye and to ease any pain. Medication in drop or tablet form will reduce the aqueous production in the eye and improve its drainage. Prescribed eye drops must be used every day as advised by a doctor to ensure consistent lowered pressure in the eye, otherwise the pressure will start to rise again. Long-term treatment can be done with laser surgery, which is not painful. A laser is used to open the holes in the draining system to help fluid drain out of the eye or stop the eye producing as much fluid. This procedure is usually quick and causes little discomfort. It can be done under local anaesthetic with no need for an overnight stay in hospital. The success of this type of treatment varies from person to person and eye drops may still be needed afterwards. Open angle, closed angle and congenital or developmental glaucoma are all known as primary glaucomas as these are not related to any other ocular disease. The most common causes of secondary glaucoma include inflammation of the iris (iritis), hyphaema where blood may have been present for some time in the anterior chamber, iridodialysis; detachment of the iris from the ciliary body, or post cataract surgery. DVLA guidelines state that drivers must meet the recommended national guidelines for visual fields when diagnosed with glaucoma by an ophthalmologist. This is part of a standard eye examination involving a visual field test where small spots of light are randomly shown on a screen. Any points missed will be plotted on a field of results sheet for the ophthalmologist to review. If the loss of visual field is not too advanced driving will still be possible but anyone diagnosed with glaucoma should have regular checks to ensure their vision is of the required standard. The International Glaucoma Association provides a useful leaflet on this along with advice on all other aspects of how to cope with the condition. More than anything else, regular eye examinations are fundamental in the fight against glaucoma. Early detection and treatment are key to the prevention or slow down of further damage and greatly increase the chances of living a normal life. Tomorrow we have a recipe for healthy eyes… could eating carrots really help you see in the dark or is this just an old wives’ tale? Also what vitamins are beneficial to your eyes?